Historically, collective bargaining has led to comprehensive health benefits with a broad choice of providers, modest enrollee premium contributions and limited patient cost sharing at the point of service. With rising health care costs crowding out wage increases, some labor unions are pursuing measures to slow health care spending growth without increasing workers' out-of-pocket costs, according to a study by researchers at the former Center for Studying Health System Change (HSC). 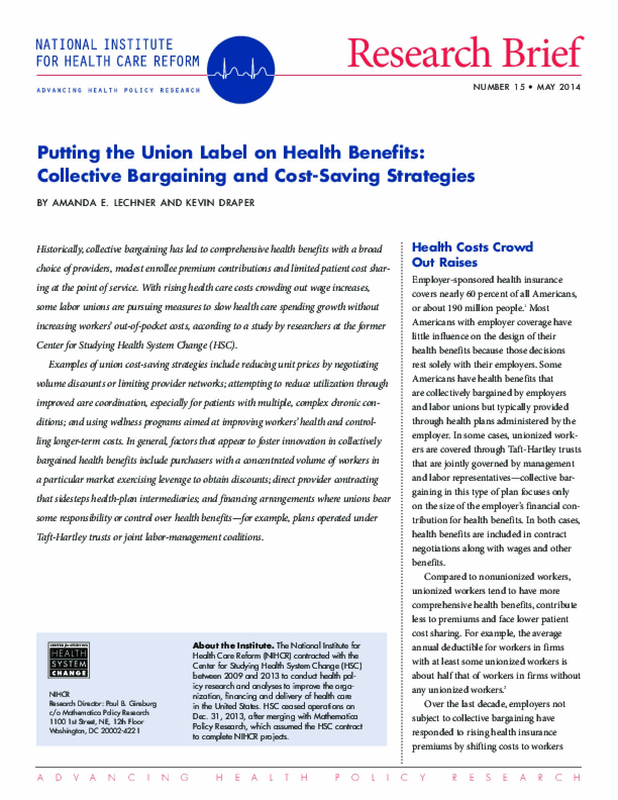 Examples of union cost-saving strategies include reducing unit prices by negotiating volume discounts or limiting provider networks; attempting to reduce utilization through improved care coordination, especially for patients with multiple, complex chronic conditions; and using wellness programs aimed at improving workers' health and controlling longer-term costs. In general, factors that appear to foster innovation in collectively bargained health benefits include purchasers with a concentrated volume of workers in a particular market exercising leverage to obtain discounts; direct provider contracting that sidesteps health-plan intermediaries; and financing arrangements where unions bear some responsibility or control over health benefits—for example, plans operated under Taft-Hartley trusts or joint labor-management coalitions. Copyright 2014 by Center for Studying Health System Change. All rights reserved.